Tulku Nyima Gyaltsen Rinpoche was born in the village of Kyidu Ruma, Tromthar District, Kham, in the water horse year of 1942. When Tulku Nyima Gyaltsen Rinpoche was born, rainbows were seen over his family's nomadic tent. A Lama named Tatse was called to see the newborn. Lama Tatse advised Tulku Nyima's parents that Tulku Nyima would become a highly realized Lama and had to be kept clean. Lama Tatse also gave Tulku Nyima's parents blessed pills. At the time of his birth, Tulku Nyima had one tooth and hair. In order to ascertain Tulku Nyima’s actual status, his father went to Gyatso Monastery for guidance. A senior monk at Gyatso Monastery put Tulku Nyima’s cap under his pillow that night. During his sleep, the senior monk dreamt of Khenpo Ngagchung. This was the first indication of Tulku Nyima’s prior incarnation. The great Jamyang Khyentse Choki Lodro recognized him as the voice reincarnation of Khenpo Ngagchung when he was just a small child. At the age of 12, Tulku Nyima went to Nyoshul Monastery and trained under many masters, including Arik Rinpoche—his root teacher— Orgyen Rigdzin, Khenpo Munsel, and Choktrul Pema Gyurme. 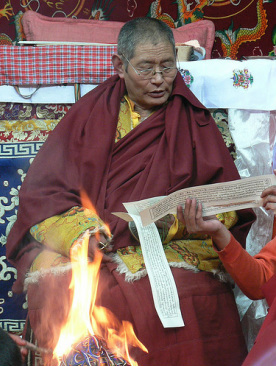 During this time he studied and meditated on the classic works of the Sakya and Nyingma traditions. Tulku Nyima has been the abbot of many different monasteries in Tibet since 1985 and has taught in universities both in Tibet, China and in America. He has many disciples, among them lamas and tulkus from many regions including Central Tibet, Kham, Amdo, and Inner Mongolia. In 2003, on his first visit to the United States, he met His Holiness Sakya Trinzin who recognized him as a 'genuine reincarnate lama of the Sakya tradition.' His Holiness also described him as "well accomplished." He also met His Eminence Garchen Rinpoche of the Drikung Kagyu tradition who publicly encouraged his students to receive teachings from him. In addition, Tulku Nyima is recognized as one of the five emanations of Khenpo Ngakchung, one of the greatest Nyingma masters of the previous century and a prophesied emanation of Vimalamitra and Longchenpa. Since 2002 he has been the abbot of the Dokho Monastery in Derge, Eastern Tibet. In 2003, he taught at the University of Virginia and several Buddhist centres on the East and West coasts of the United States. That same year he announced his intention to establish his first centre in the West and named it Sakya Dokho Choling; it is located in Germantown, Maryland. Tulku Nyima Gyaltsen, along with Venerable Traga Rinpoche, consecrated RigDzin Dharma Center in 2005.